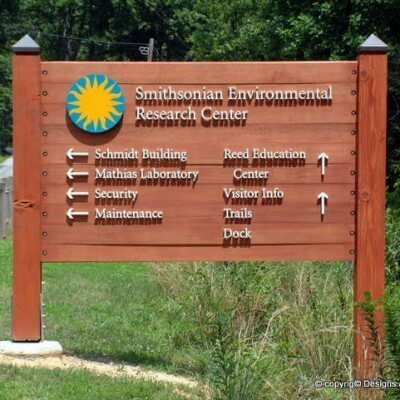 Cedar signs manufactured and installed by Designs & Signs at The Smithsonian Environmental Research Center in Edgewater, Maryland. A total of seventeen similar way finding signs were installed at this location. Each sign was constructed with cedar plank. The routed komacel letters were finished with automotive paint and pin-mounted with stainless steel pins. The circular logo was printed and mounted on komacel. UV protective clear coat was used to protect the bright printed colors. MORE PHOTOS (cedar signs) COMING SOON! We are currently working on some new signs for the Research Center we’ll be posting those photos soon! Sandblasted Signs for YOUR Business Too!